I am going to try to maintain this thread as a summary of my current work in progress on improving music library features for the Kodi v18 Leia release. Here you will find a basic road map of what is currently being developed along with my todo list. Any help others can offer - testing, discussing design, documenting or just being fun to hang out with and share my moans - is very welcome. If anyone has the skill, time and interest to set up an IDE and get involved that way then great. At any time there may be a music test build available with my work so far that is ahead of the nightly. This is from my repo, and differs from Leia master, because of the delays in getting review and approveal to merge so it can appear in the nightlies. As all my work is focussed in one area it is often cumulative, so I can't raise later PRs until the first is merged without a lot of review confusion. Testing of my work before merge will help with the review/approveal process. I will probably split any testing feedback or feature discussion posted here into a new thread, to stop this thread growing too big and becoming unreadable. Watch out for those when posting. The need for a forced scan is now held in the db, so with client server setups you only get prompted once after an upgrade, not every client. PR11557 This also added option (add <promptfulltagscan> to the musiclibrary section of advancedsettings.xml) to be prompted for a forced scan of tags when rescanning a source from context menu of fileview. Very useful when testing changes to tag processing but was later PR12891 replaced by a question folowing selection of "scan to library" on the context menu in file view. Scan all metadata tags from the music files first before scraping (rather than do it album at a time). This populates the library with the basic music without delay so the user can start using it. Tagging can be mixed quality - some with mbids, some without, so artist mbid may be obtained from music files later in the scan. Avoids unwanted consequnces arising from the order in which folders are processed. The common example of this is the compilation/NFO issue where early processing of various artist compilations causes the artist folder to be misidentified and artist.nfo is either not found or scraping goes wrong. The work around was to put all compliations in a folder named "zzzzzCompilations", to ensure it was processed last, otherwise the song artists from these albums was added to the library and additional info scraped before the other albums by that artist had been scanned, and so the artist.nfo file was never found and applied. This is no longer required. Having passed through all the music during scanning tags we know how many albums we are processing, so during scraping phases the progress bar can show meaningful position though task. Repeat of failed scraping due to server timeouts could be added at a later time. Scraping album artist(s) as part of library update, even if the album lookup has failed. Otherwise known artists can go unscraped just because the albums in the library are not found. Avoid repeatedly requesting artists that are not in the online sources. Changes to Universal Album Scraper (v2.7.2) https://github.com/xbmc/repo-scrapers/pull/51 avoiding inefficient duplicated requests to Musicbrainz. @olympia has also fixed some additional parsing issues. a) Setting artist or album info provider selectively that works! Export done asynchronously (not lock UI), with new dialog (rather than series of yes/no dialogs), offering export of all artists and allowing greater control of what exported to where. Extra Artist Data (type, gender, disambiguation) PR12963. The music db version is bumped to 68. GUI info label, media filter and smartplaylist support is added, and the data is included in import from and export it to xml and NFO files. Add GUI info labels for artist sort name (PR11738) and album release groupd id data (PR12120). Update JSON API to include all the above. (N)New Information Provider Dialog PR12987. 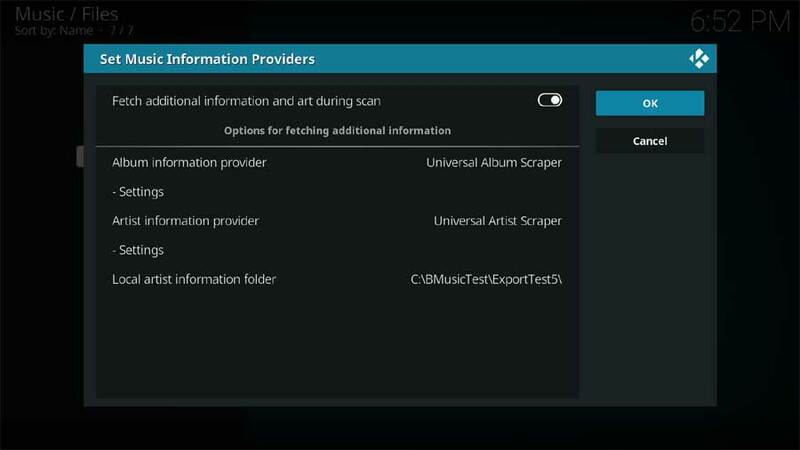 Easy access to default music scraper (Info Provider) settings when adding music source via a "settings" button. (F)Fix Album Genre Inconsistencies PR13042. Genre in library navigation is implicitly song genre. SetAlbumDetails() and SetSongDetails() - get these to actually work!!! (F)Fix wrong playback order for smartplaylists, playlists and upnp PR13059 Longstanding Trac ticket that had playlists started from JSON always in a set order. Music library extended artwork support Epic discussion on the forum core framework to support any art type set via JSON API, addons or manually via UI. Artwork consistently available to the GUI via Listitem.Art(...) and Container.Art(...)PR13352. Refactor Song Information dialog PR13533. Move data read and write off the main thread to avoid possibility of locking UI. Refactor Artist/Album Information dialog PR13672. Get album or artist art changes to show immediately. Update the artwork for the currently playing song, or songs on current playlist, if the related album or artist art changes. Improve artist discography list to always show all the albums in the music library by that artist, and then any additional titles scraped from online sources. Replace the scraped track listing on album info dialog to show the songs in the library from the album. This change happened in DB v68 and deprecates the albumsonginfo table . See 298528 (thread) and PR12597. Fixed issues with resfresh button after switching between artist and album info dialogs (same dialog so gots confused). Some baby steps to improve disc set handling by correctly picking up any thumbs from subfolders when the album is spread across multiple subfolders (one per disc), as well as album (the boxed set) and artist art. See more details here. Note this does not handle round disc/CD art (round images), but cover (thumbs) that each disc in a boxed set could have. Add the option to automatically use scraped art in preference to that found embedded in music files. See thread for details. It makes fetching additional art, from local files or scraper results, configurable in a white list rather than hard coded. This means showing additional art, such as "clearlogo" or "discart" or anything else people may dream up in the future, will just be a matter of either putting the correctly named image file in an appropriate place, and/or the scraper returning a URL for it , and then editing the skin. See thread for details, discussion and feedback. New facility to filter artists, albums and songs by media source, from either side blade filter or smartplaylist rules. It is very natural to categorise music by putting it under separate folders, and with the introduction of the Artist Information Folder, users can arrange their music files into whatever folders they like (there is no longer any need to try to have all the music by an artist, and only that artist, under one unique folder in order to have local art and artist.nfo files). By adding these folder as separate sources (via the media source dialog), items can then be filtered using them. See thread for details, discussion and feedback. An internal reworking of the batch access to song, album and artist data via JSON API making it significantly faster. (P) = Partial, more phases to come later. How users can optionally see music by the date it was originally produced as well as the post 1980s release dates of all digital media, and support for month and date. A unification of SQL Query building so that filtering and navigation from playlist results combines query logic correctly. Essential ground work before filtering and navigation options can be extended. First attempts are here PR10098, but this needs further work. Needs to fix navigation of results when have smart playlist within smart playlist, and navigation of artist search results when role <> 1. While others are looking at converting to Python based scrapers, a review of how music is scraped, what data fetched etc., how it is merged and any other core changes to support the Python change. This is the stuff that I feel I have a reasonable chance of dealing with as a single dev, or have a strong interest in. I know there are a lot more requests for things people would like, and major changes that are beyond me, for my sanity they are not listed here. But I am happy to collaborate or offer support where I can if anyone else wants to make improvements or fixes to music. Fix track number smart playlist rule to correctly split just track number form the combined track and disc filed in song table. Add disc number as a smart playlist rule and filter option for songs and albums. Add filetimestamp (misnamed Dateadded field) as smartplaylist and filter rule for artists, albums and songs. A way to list those recently added or not yet sucesfully scraped for re-scraping attempts. Apply folder type node options at genre or role level. Currently can create a node with say <path>musicdb:// genres/?ambumartistonly=true&year=1988</path> that will show all genres, but when navigate down for a selected genre the options are applied only see the album artists with songs from 1988, and there could be nothing to show. Fix way APIC tag is handled to correctly fetch front cover art when there is more than one image. Explore possibility to handle more than one image per song or album. Include embedded in art browse/selection from album/song information dialog. Genre Separator - Allow for multiple item separators, add ";" (a sensible separator value). Useful for ID3 v2.3 tags (single frame) as semicolon is the default separator used by meia Monkey when tagging. Clarify JSON API and smart playlist/filter rules where artist, album and song genre are being used. Process TOTALDISKS, DISCTOTAL (TPOS) tags so can show disc 2 of 3. Add support for album series e.g. “Now That’s what I call music”, to help categorise and navigate various artist complitaions. Some breakup is possible via custom nodes based on path rules, but maybe could scrape Musicbrainz series id and use that to identify series. Look at initially sorting in DB using ORDER BY and COLLATE for efficiency (currently all sorting is done in memory after fetch from db). But still need to be able produce same sort order in locally held FileItemlist for subsequent on screen order changes. Fix issues where user gets stuck with artist image even when image file has been deleted. I'm just one man so hitting this thread with posts for lots of feature requests (or reminders of what has been requested before) genreally is not going to work; making my todo list unmanageably long is easy. I suggest you create your own thread for those, I will see them and respond if I can. I would love to be able to do more I really would. There is a window of opportunity for others to helpfully post some friendly reminders if I have said elsewhere I would do something and I have missed it here. But please just don't tell me how easy you think something is unless you have also submitted a PR to make the changes and just want me to review! I will be deleting posts and editing etc., so do not take offense if that happens to your post. I declare this thread is mine to do with as I will!!! This is the stuff that I am am aware of but do not have the resources as a single dev to deal with at this time. I am happy to collaborate, or offer support where I can, if anyone else wants to take these up. Support for the various names an individual artist can have, both in different languages and the likes of "Prince". Is "Forced scanning of tags" thought of as a full library/source scan or even on a per-folder/partly scan? Quote: Is "Forced scanning of tags" thought of as a full library/source scan or even on a per-folder/partly scan? Yes, can do per folder. When enabled from advanceded settings, in fileview navigate to a folder and choose "scan to library", then you will be asked if you want to scan tag in files that have not changed. It then skips the hash check and reads the tags. A better UI will come before v18 is released, but it is useful now as a dev tool. What I list here is another issue where having "cleanonupdate" enabled prevents subsequent scraping from doing anything. That didn't get backported. Awesome stuff, I ran into cue sheet troubles a fair few years ago now when the cue sheets seemed to be overriding my tags but believe that was fixed a while back. Nice to see some of the more advanced stuff fixed. Regarding metadata and what is scraped, I am of course here to help with that. I truly believe that the less interaction a user has when scanning in their library the better (with power user features still available if needed) so I would love to see any kind of simplification of this. Documenting what data is scraped on the wiki would also be very useful. Thanks Dave! I can certainly test, as I am already running Leia in my main HTPC. According to Musicbrainz https://wiki.musicbrainz.org/Style/Artist/Sort_Name, the sort name is supposed to be written in Latin script (assume Latin-1?). So for non-western artists, sort name becomes an "alias" for the artist name which is written in the preferred script. 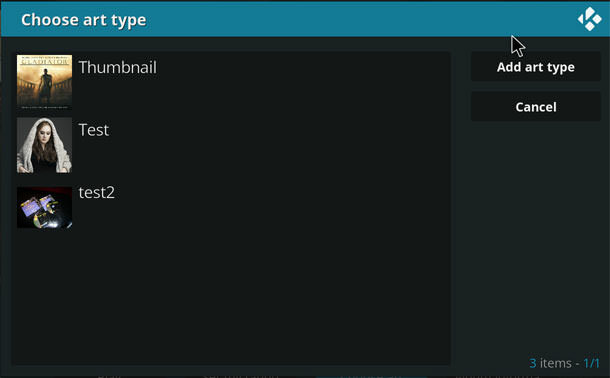 It seems like this would be useful in Kodi, at least as an infolabel for listitems and player. It might also be better if usage was available as a boolean/built-in rather than advancedsetting. How do you foresee skins handling this? Here to help / test in whatever capacity as always Dave, just let me know. Thanks for the offers of testing help. Will keep these comments in mind Scott. I have more phases of artist sorting to implement - info lables are on that list along with JSON access. When I have done all areas in one PR before it has been even slower to get approveal, and the many rebases along the way are painful, so this time I am trying a phased approach. Seems reasonable that skins should have both artist name and sort name available. But I am undecided about making sorting using sort name rather than artist name as another sort option in the list, I am concerned it will just be clutter for many. Using advancedsetting is just an initial way to make it available, I intend to make a settings up date with various changes all in one go at a later point. I think you are suggesting that it could be a skin level choice? Dave, is the discussion here 305853 (thread) covering a way to get a playlist to display the artwork for a currently playing track via a switch or the like, likely to get included in your deliberations ? Only thing I can think of is my eternal request for some kind of A-Z node but done in a programmatic way. Razze gave it a go at one point but didnt find an easy way. This would allow us to quickly choose music like a real jukebox. (2017-05-15, 10:59)docwra Wrote: Only thing I can think of is my eternal request for some kind of A-Z node but done in a programmatic way. Razze gave it a go at one point but didnt find an easy way. A problem is this is affected by general collation issue where other scripts than just ascii are involved. (2017-05-15, 10:38)tkgafs Wrote: Dave, is the discussion here 305853 (thread) covering a way to get a playlist to display the artwork for a currently playing track via a switch or the like, likely to get included in your deliberations? I'm still hoping someone else will pick this up, so it is lurking between "todo" and "this I don't have resources for". I won't tidy-up these posts until I decide which, but it will get on the list one way or other. There are non-ascii typescript related difficulties as Scott says, but I get the need to split up large lists of items this way. Would it be wrong to have something for the ascii names, even if it failed for other scripts?